April 25, 2011 - The National Terrorism Advisory System, or NTAS, replaces the color-coded Homeland Security Advisory System (HSAS). HSAA was created by Homeland Security on March 11, 2002, in response to the September 11 attacks. The use of the system had been up heavy criticism during the Bush administration. HSAA system is scheduled to be phased out by April 27, 2011, and replaced with a new system the National Terrorism Advisory System. This new system will more effectively communicate information about terrorist threats by providing timely, detailed information to the public, government agencies, first responders, airports and other transportation hubs, and the private sector. In 2009, United States Secretary of Homeland Security (2003?2005) alleged in his book The Test of Our Times: America Under Siege...and How We Can Be Safe Again that top aides to President Bush (including defense secretary Donald Rumsfeld and attorney general John Ashcroft) pressured him to raise the alert level on the eve of the November 2004 presidential election. Ridge refused. "After that episode, I knew I had to follow through with my plans to leave the federal government for the private sector," he said. 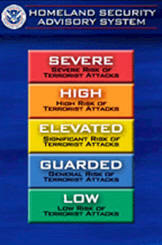 Under (NTAS) the new system there will a two-level alert ?Imminent Threat Alert? which warns of a credible, specific, and impending terrorist threat against the United State and the second will be ?Elevated Threat Alert? which will warn of a credible terrorist threat against the United States. United States Secretary of Homeland Security, Janet Napolitano said the color-coded system often presented "little practical information" to the public and that the new system will provide alerts "specific to the threat" and that "they will have a specified end date." After reviewing the available information, the Secretary of Homeland Security will decide, in coordination with other Federal entities, whether an NTAS Alert should be issued. NTAS Alerts will only be issued when credible information is available. The NTAS Alerts will be based on the nature of the threat: in some cases, alerts will be sent directly to law enforcement or affected areas of the private sector, while in others, alerts will be issued more broadly to the American people through both official and media channels. An individual threat alert is issued for a specific time period and then automatically expires. It may be extended if new information becomes available or the threat evolves. U.S. Travel Association Applauds Homeland Security Chief Regarding New Terrorism Advisory System. Reacting to the new terrorism advisory system introduced today by Homeland Security Secretary Janet Napolitano, Roger Dow, president and CEO of the U.S. Travel Association, issued the following statement. "On behalf of the entire travel community, I applaud Secretary Napolitano for establishing a clearer communications process to more accurately reflect situations that may involve terrorist threats. Breaking communications for specific situations into elevated or imminent threats provides a mechanism for the traveling public to better understand current circumstances so they can travel with confidence. "We look forward to working with officials at the Department of Homeland Security to identify and effectively address other circumstances, such as state of emergency declarations, where clearer communications can help the public and avert confusion that may lead to significant economic impact." NTAS Alerts will be issued through state, local and tribal partners, the news media and directly to the public via the following channels; Via the official DHS NTAS webpage, via email, data feeds, web widgets and graphics and social media such as Facebook and Twitter. The public can also expect to see alerts in places, both public and private, such as transit hubs, airports and government buildings.